England came from behind to beat Jamaica 54-50 to stay top of Pool B at the Netball World Cup in Sydney. An error-strewn first half left England five points behind, but they recovered in an exhilarating third quarter to lead 39-37 with 15 minutes to go. And the world number three side held their nerve to seal a four-goal victory, to keep them on course to progress as group winners. Earlier on, group rivals Scotland secured a 47-36 win over Samoa. England will be favourites to beat Samoa on Sunday (07:20 BST) in their final group game and should they finish top, Tracey Neville's side could avoid a meeting with holders and hosts Australia in the next round. Scotland play their final game against second-placed Jamaica on Monday at 10:20 BST. 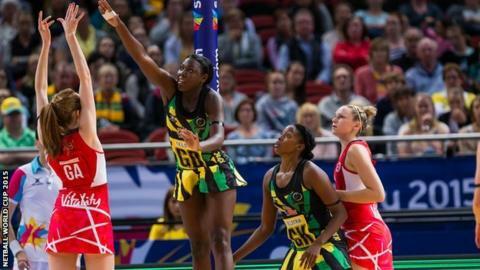 Jamaica sit one place below England in the world rankings and their rivalry was heightened after the Sunshine Girls beat England to the bronze medal at the 2014 Commonwealth Games in Glasgow. A minute's silence took place before their latest contest to remember head coach Neville's father, who died on Friday after England's first win over Scotland. In a physical first half in Sydney, Jamaica produced a strong defensive display and out-witted the England attack to take a 28-23 lead at half-time. The introduction of 20-year-old shooter Helen Housby, a zoology student at Manchester University, proved the difference in the second half, as England produced a 10-goal swing to turn the game around. As Jamaica began to tire, the experienced England defence of Eboni Beckford-Chambers and Sonia Mkoloma helped the Roses see out the game. Holders Australia showed their dominance by brushing aside Barbados 83-16 in Pool A - their 21st consecutive win in all competitions. But up next is a far more daunting prospect in New Zealand, whom they have met in the final at the last four World Cups. The Silver Ferns also made it two wins from two on Saturday, with an easy 74-38 victory over Trinidad and Tobago. Elsewhere in the competition, Malawi broke a national record by scoring 101 goals past Sri Lanka, who could only respond with 18, while Pool C opponents Singapore lost 69-21 to South Africa. Uganda continued their impressive form in Pool D with a 61-40 win over Fiji.